If you are for some reason dissatisfied with MetaTrader but still want a powerful trading platform with easy charting and custom indicators/robots, then Spotware’s cTrader/cAlgo combo could be an interesting opportunity for you to explore. Spotware is Cyprus company with Russian roots and an office in London, UK. Their cTrader Forex trading platform has been launched back in April 2011 (at FxPro) but had not gained much popularity until recently it has been adopted by RoboForex, IC Markets, Liquid Markets and Trader’s Way. 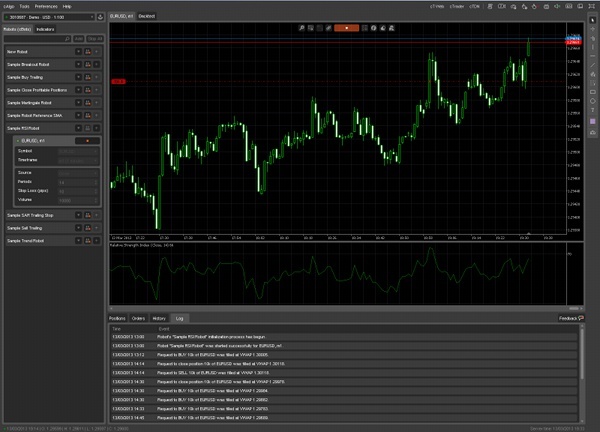 cTrader is a purely ECN FX platform with depth-of-market display built-in for every trading instrument. 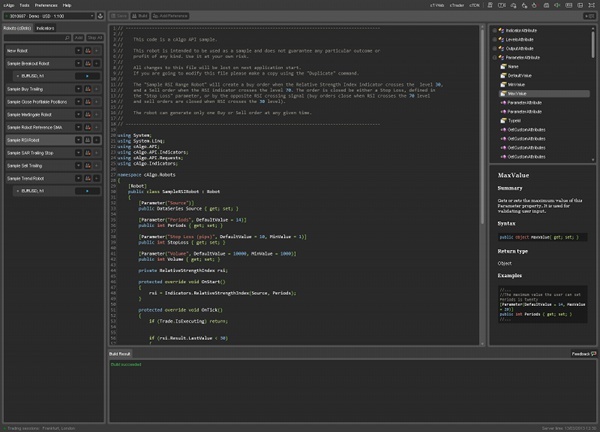 Like MT4/MT5 it has some predisposition for success: cTrader is free for traders (brokers pay for server software), offers customizable charts, coding language and an IDE to create custom indicators and expert advisors (called ‘robots’ or ‘cBots’), including organized community (forum, code base and documentation) for their development. Actually, there are two platforms — cTrader and cAlgo but they both can be connected to the same account simultaneously, virtually making them just two windows of one platform. You can use robots only in cAlgo, but charting is rather crippled there. You cannot use robots in cTrader but charting there is fully functional. You can use custom indicators in both cAlgo and cTrader. Looks familiar, doesn’t it? 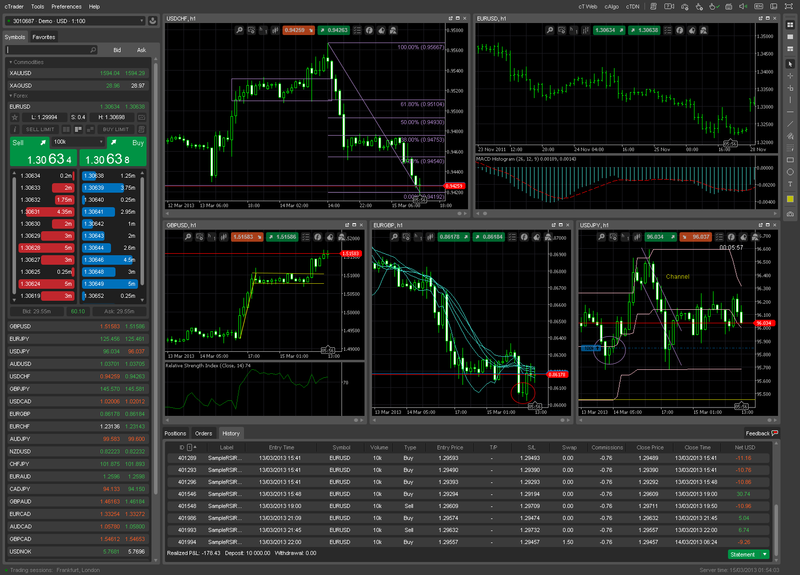 It is very similar to the default view of the MetaTrader charts. Although it is an ECN platform, hedging is allowed in cTrader. A trader may keep both buy and sell positions for the same currency pair at the same time. Platform’s interface is already translated into 16 languages. That would be a great accomplishment if only those translations were not of such a mediocre quality. cTraders offers 14 different chart timeframes (M1, M2, M3, M4, M5, M10, M15, M30, H1, H4, H12, D1, W1, MN) vs. 21 timeframes in MetaTrader 5 (M1, M2, M3, M4, M5, M6, M10, M12, M15, M20, M30, H1, H2, H3, H4, H6, H8, H12, D1, W1, MN). Quick account switching using main screen menu. Quick-trade panel with three modes: one-click trading, two-click trading and disabled. All indicators can take other indicators’ output as input. E.g. it is really easy to add standard deviation of standard deviation of standard deviation on your chart. One can do the same in MT5, but only using the custom indicator coding. cTrader has a native web-based application (cTrader Web) which is not too different from the stand-alone platform. Comfortable and intuitive interface. E.g. object placement on chart is a lot easier than in MT. cAlgo coding of robots and indicators is based on C# and .NET framework. You do not need to learn a new language, which is the case with MQL5 in MetaTrader 5. Time remaining till the next bar is displayed on chart as a default feature. Very convenient. Current trading session display at the bottom of the platform’s window. You will know when you trade London and when New York kicks in without installing any glitchy indicators. Native market depth display with three modes (volume-weighted average price, standard sell/buy mode and price levels). Individual charts can be detached from the main window, making workspace organization a lot easier for traders, especially for those using more than one monitor. 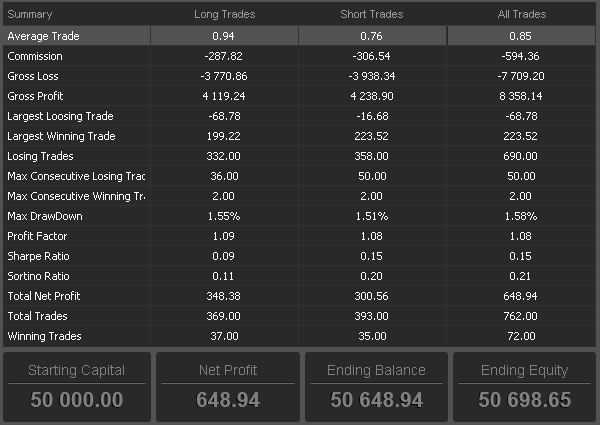 When setting stop-loss and take-profit for an order or position, percentage of account’s balance is calculated and shown automatically. Unfortunately, it is not possible to set balance percentage to get SL or volume calculated. Educational videos are embedded into cTrader and cAlgo. Do not understand something? Click the video icon and you will get it explained to you in minutes. Too bad there is no built-in way to record your own chart videos, though I would expect this feature to appear soon. Chart objects have no properties dialog to work with — you can only move them around but cannot set numeric price/time levels. List of chart objects is rather limited: vertical line, horizontal line, trend line, equidistant channel, Fibonacci retracements, rectangle, ellipse and text label. Of course, it cannot be even compared to the abundance of graphical objects offered in MT5. No native stop-limit pending orders (a pending order that becomes a limit order after a given stop price is reached). No native support for OCO (one-cancels-other) orders (MT does not have them either though). There is no optimization and the backtests are very limited in settings and features. It is not possible to save report to file in backtesting results. When a robot is running its source code becomes locked, so that you cannot even scroll through it. Limited time period for backtesting of robots — 1 year is the maximum. Chart history is also very limited. For example, I could not scroll back EUR/USD @ H1 chart further than November 21, 2011. Current swaps in demo accounts are rather misinforming — they are +0.5 pips for long and +0.1 pips for short positions for all currency pairs, including gold and silver. Of course, it has nothing to do with the reality of the FX trading. cAlgo IDE and language capabilities are way inferior to MQL and its editor. For instance, there is no right-click contextual menu at all in the coding environment. Neither take-profit, not stop-loss can be set farther than 1,000 pips from entry. It is hard to understand the logic behind such a design decision. Overall, I believe that a great future lies ahead of cTrader. With their turn-key solutions for brokers, they surely will become quite a popular trading platform soon. Currently, only 5 brokers out of total 194 presented on EarnForex support cTrader. Constant improvement and updates are also helping Spotware to win the hearts of traders. One of the features that I did not mention before is the built-in feedback form. It is a good idea, which is often present on websites, but it is a rare part of the user interface in stand-alone applications. PS: The description of cTrader and cAlgo presented here is valid as of March 18, 2013. As I have said, it is updated quite often. PPS: Some fun from cTrader Web coders — register a demo account and after logging in, input HARLEM in the search field, press Enter. You are free to comment on cTrader/cAlgo platform if you have tried trading with it before or ask questions if you plan to do so in the future. Please also tell me if you would like me to post more information about cTrader and share some custom indicators/robots for this platform. Why cTrader Is Still a Contender? Thank you for your honest review. We will look into your valued feedback and try to incorporate it to our products. Stay tuned with our developments and constantly growing list of brokers and banks that are just about to launch NDD/DMA cTrader suite. You can share your MT4 EA here and I will look whether it can be converted to cBot at all as not every EA is convertible at the moment. cAlgo and cTrader platforms are defenitely a force to count on. Spotware listening to the traders feedback and are constantly improving their platform with regular updtates. Very impressed with their dedication to make it the best platform ever. With ctrader there is no point having stop orders in place on your chart..when the mm’s do the flash candle flicks your limit orders get activated in position but your stop orders are physically pushed to a new area and the following pullback instantly puts your now activated buy/sell stop position into negative..great news for the broker.